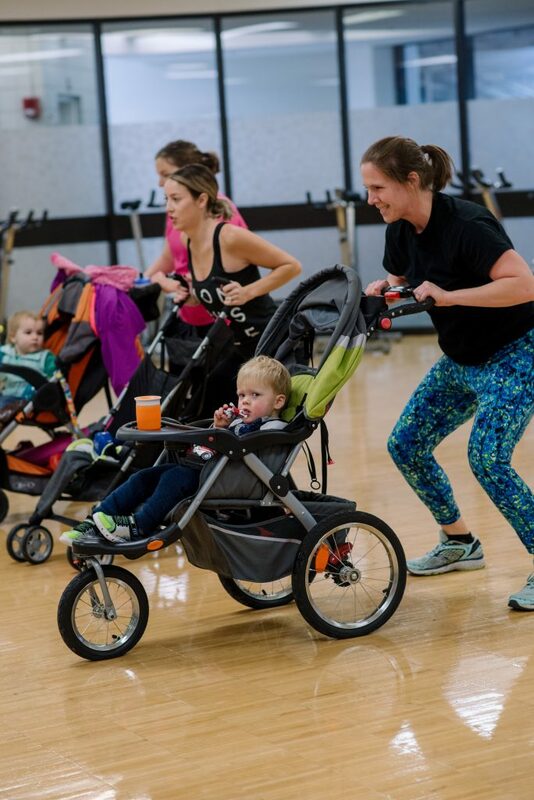 A new fitness class has rolled into Kettering – Strollers in Motion, a chance for caregivers and little ones to work out together! We dropped by the class recently to check it out. While their moms enjoyed a full-body workout, the littles rode in style. Four moms with strollers jogged in laps, did squats and lunges all while pushing strollers. No mean feat – if you’ve ever pushed a stroller, you’ll know this can be a workout in itself. The class also includes work with free weights and stretches. For the kiddos in the strollers, the class was just as much fun – they giggled as their moms wove in and out of a maze of strollers and sang ‘The Wheels on the Bus,’ and enjoyed sneaking drinks from water bottles. Older siblings played quietly with toys and had fun with a large tire right in the exercise studio. The class is very relaxed – kids who were ansty in the strollers were free to roam and older ones who wanted to join in were welcome to do so. Everything about the class is as kid- and parent-friendly as possible! Instructor Mandy has been teaching this class at the Kettering Recreation Complex (and when the weather is warm, outdoors at Indian Riffle Park) since summer 2017. “Strollers in Motion partners specifically with rec centers and has for several years and with several cities in the area,” she said. Mandy is certified by Strollercize, the national organization of which Strollers in Motion is a Dayton-owned franchise. Learn more about upcoming Strollers in Motion classes!